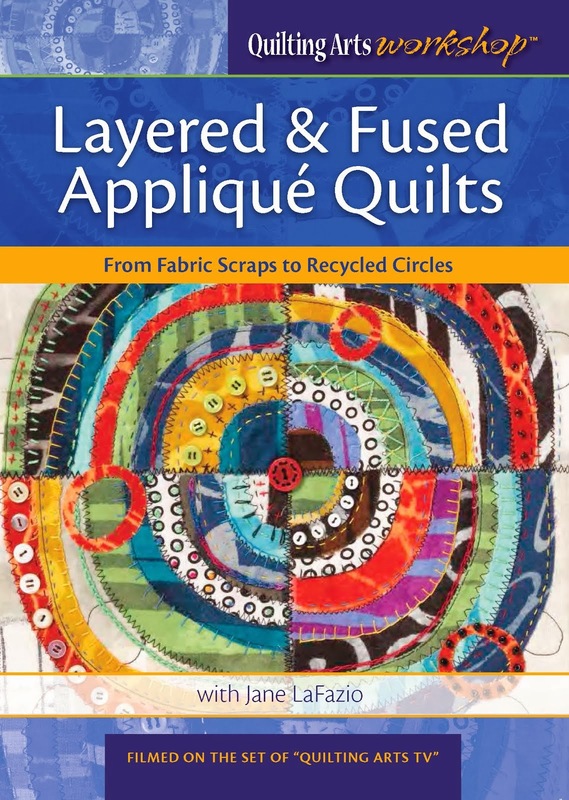 Suzanne Sanger is the winner of Tracie Lyn Huskamp's book! Suzanne, email me with your mailing address. Congratulations!! Finished up my week of teaching elementary school kids with this grand finale! They drew and painted the birds from my 'collection' from Michaels craft store. 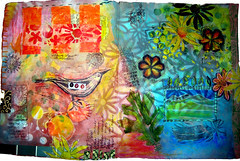 Then, since we'd been given a whole bunch of those cheap, colorful, useless brushes, AND, we'd been to Quilt Visions the day before and learned about weaving, they used the collage paper they'd made earlier in the week, and I showed them how to weave the brushes and paper into a frame with fabulous results! You can see the other kids work here. 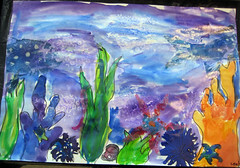 Here's one of the kid's underwater scene paintings. I created this lesson plan, and frankly, I think it's a winner! Here's how we did it in our 2 hour class. 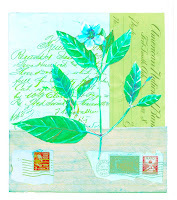 1) Using bubble wrap, painted with white gesso, stamp randomly over the white watercolor paper and let dry. 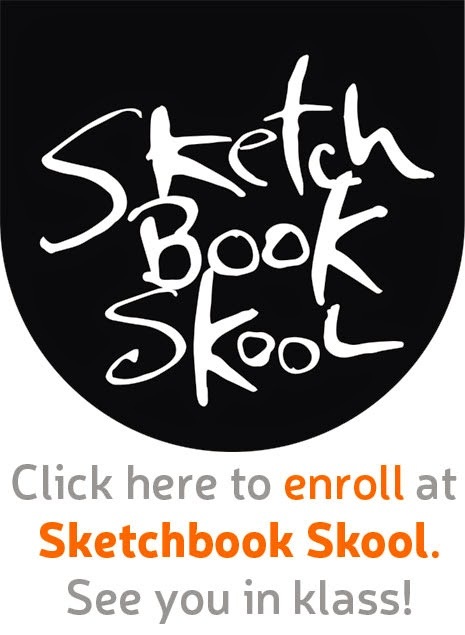 3) Draw an underwater scene with pencil (I demo-ed drawing painting red coral, green kelp). Go over pencil lines with permanent marker, erase pencil. 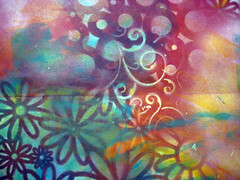 Wet background and drop in blues and purples to create water. Let dry. 4) Carefully cut out fish prints. Mix white glue with a little water, and pour some on the paper, smear it around with your hands. Carefully place cut out fish print on top of glue, and with more glue on your fingers, carefully smooth fish out so it's completely flat and adhered. Let dry. The tissue will dry transparent. You can see some other examples of the kids art here. More fabric in my Spoonflower shop! This one is a page from my Orvieto Sketchbook. I ordered 3 yards of it--not sure yet what I'll make (or hire Ileen to make for me :-). 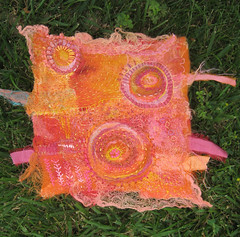 Of course, it would make the perfect market tote, or journal cover...hmm.. 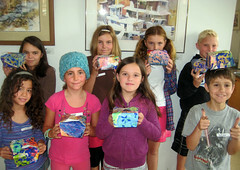 The kids proudly showing off the boxes they made. 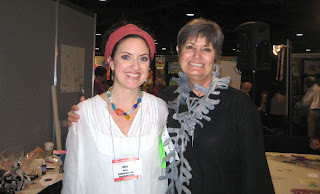 I’ve had the pleasure of taking a workshop from Tracie Lyn Huskamp and count her as a friend. I thought you enjoy getting to know this very talented artist a little better. Jane: Your work is consistently nature inspired. You really stay focused on the theme. Is it a conscious decision, or is it simply your overriding passion? 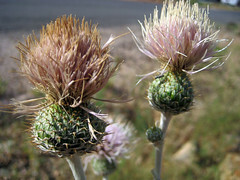 Tracie: Discovering nature as an artistic muse revealed itself to me in a very simple, yet profound experience. It wasn’t until I signed-up for an open-air painting class in the summer of my sophomore year of art school that I discovered this source of inspiration. In the past, I had never been much of a fan of the outdoors. I didn’t like camping, bugs, or any sort of inclement weather. So I have to laugh when I think back, wondering how I even convinced myself to register for the course in the first place. 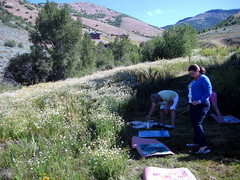 But from the very first day of plein-air painting, I was completely mesmerized. This was the first opportunity I had really ever taken to spend any time actually studying the amazing beauty of nature. And in the quiet moments of those class periods with only the sound of the wind rustling through the leaves and grasses, along with the birds singing overhead, I felt part of the world as a whole. I had finally found a subject I wanted to explore over and over. Nature had captured my full attention, and I wanted to share my discovery, my joy, and my enthusiasm with anyone and everyone. After this six-week class ended, I continued to make art using various nature subjects, refining my painting skills and mixed-media techniques. Even after ten years of creating nature artwork, I feel no desire to stop using natural subjects to convey my artistic messages. Nature continue, even today, to inspire and capture my imagination. Jane: Poetry. You’re a poet, right? I so admire that skill and art form. 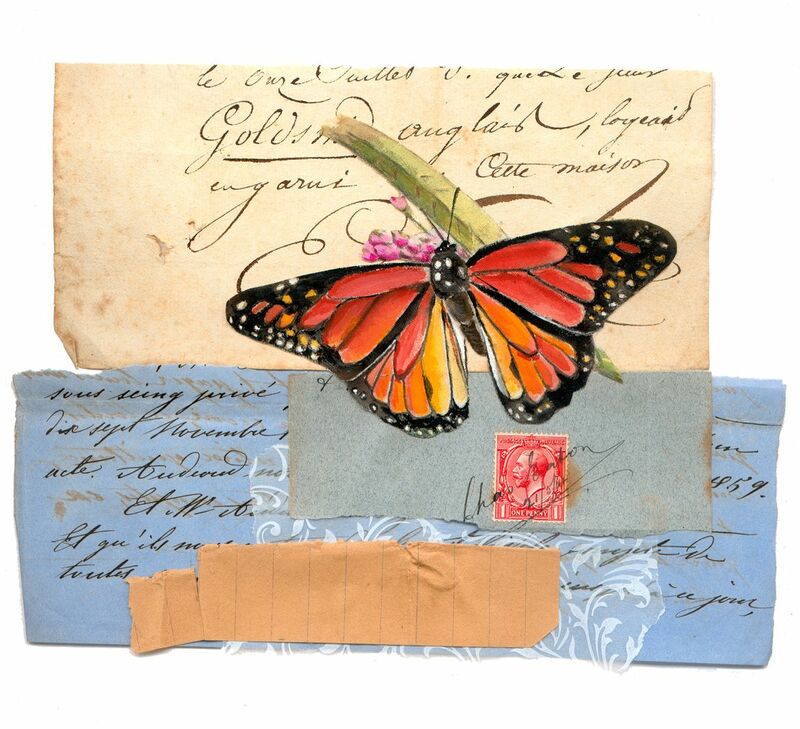 Tell us about your poetry, process, and upcoming (or published) works. Tracie: We have all seen words such as "dream", "create", and "believe", etched into a piece of jewelry. These syllables entice us to embrace and have faith in these ideas that we tout so boldly around our neck and wrist. Over four years ago, I purchased a small simple necklace from Ms.Nina Bagley that also had one of those single word proclamations, but this particular piece was different. This word did not ask for a response. It was instead... a definition... a name I could call myself... a title that might change the way someone looked at me, for those who bothered to stop and read the four letters. The word was "Poet". Every time I wore this dainty pendant, I felt empowered... I FELT like a poet...... Often penning small bits of prose during brief moments, I suppose I have always been somewhat of a closet poet. However, I could never bring myself to tell anyone what I was doing, or even begin to think of myself as a real writer. Poets are individuals that eloquently carry us away in a flurry of emotions... describing ever so gently... so tenderly each thought and every feeling. And here I was... playing,.. pretending,... hoping.. that maybe...just maybe my meager verse might do the same. Never would I dream of whispering the phrase or shouting to the world.... "I AM A POET!".... until I purchased this small adornment with a tiny word on the front. And so it was that I sat at my computer, one Christmas eve...and the only gift I can think to give a weary world to honor this glorious occasion... was a little piece of myself... a little bit... of poetry. I have since self-published two small poetry books that have been extremely well received. My hope is to continue this endeavor with a third edition to debut at Christmas and perhaps have my words will be discovered one day by a book company. Jane: You’ve been working on a new fabric line. What a great opportunity! How did it come about and tell us what you can about the new line. Tracie: Designing my own fabric was a serendipitous happening that came from my desire to return to product design, which was my job in the corporate world, and the meeting of a fellow teacher/friend that was already designing fabric. Unfortunately, I can't divulge any sort of hints about what it will look like because we are still in the design phase. But, I am SO EXCITED to see these ideas come to life! I am currently very busy working with WIndham on different pattern options, and we should be making final selections for the line soon. Designing fabric is a bit of a challenge because you really have to be aware of how a particular pattern will repeat, the scale, and creating coordinates to match. There is a lot to consider. Jane: Speaking of nature, tell us about your home/studio surroundings? Do you live on a natre preserve or do you just find and appreciate the small bits of nature that we all (speaking for the suburbanites) have in our daily life. Tracie: Although my suburban home skirts the edge of farmland, Kansas has an INCREDIBLE landscape. Wichita is located close to the Oklahoma border. I actually drive to Kansas City a lot, so I am quite familiar with the terrain between Wichita and Kansas City. This landscape is called the Flint Hills. If you can image a desert, but instead of sand, it is all prairie grass, rolling hills, and big blue skies. That would be the perfect description of this area. It is awe-inspiring to see, and I have witnessed this marvelous place in all seasons. I never get tired of gazing upon it. 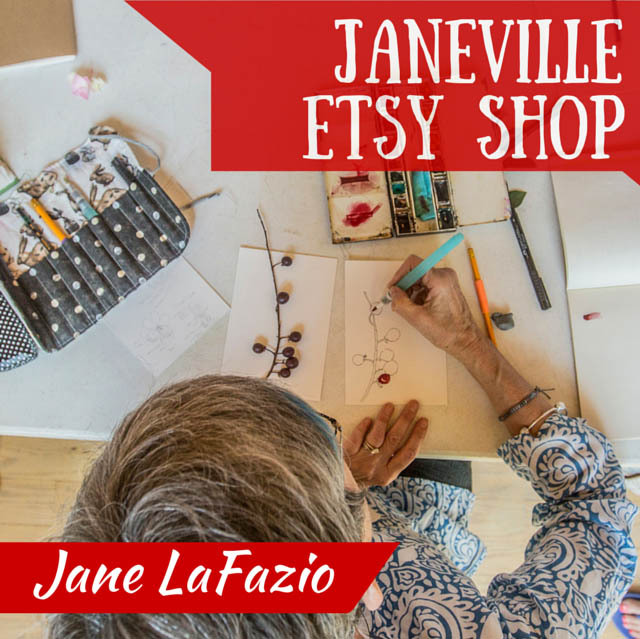 Jane: The Red Door Studio is your blog name. Where does the name come from? Can we SEE the red door?? Tracie: Yes... no.... well sort-of... Six years ago, my husband and I decided to build a new home. I was picking exterior colors for this new house, and had planned to use the color red for our front door. At the same time, I was in the beginning stages of developing a serious art career outside the corporate world and working with a lawyer to turn my new art company into a business. I needed a name for this new business, so with thoughts of my new home and my new door in mind.. The Red Door Studio was selected. However, it is funny how life sometime takes you in an opposite direction. Later on, we ended up having trouble finding certain selected materials for the exterior which changed our color scheme thus also changing the color of the front door. Today my front door is a lovely blue, but I dream of having a studio that is separate from the house, one day, and when that happens I will definitely paint the door red. 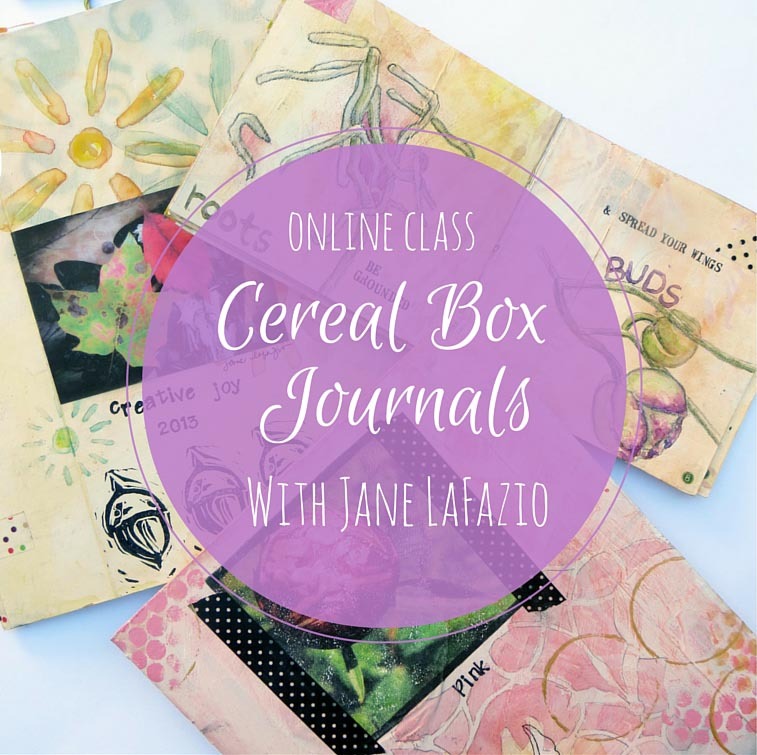 Jane: Do you keep a regular journal or sketchbook? 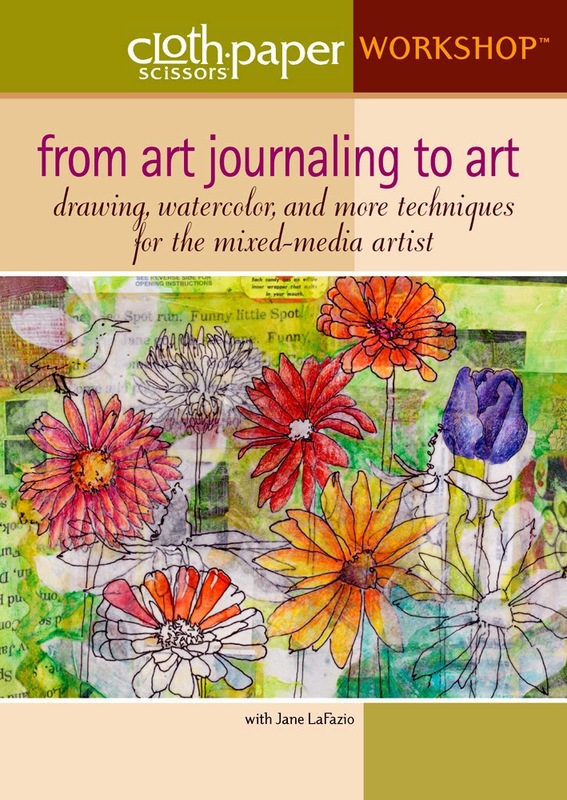 Is each page ‘art’ or is a messy filled with ideas and sketch type of book? Can we see a page or two? Tracie: I tend to have a more artistic style of journaling. I think of each blank page, every white canvas as only the beginning to a true work of art. I am currently working in an old vintage account ledger. 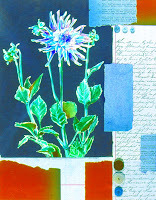 Painting and collaging my way through the pages with moments experienced in my garden, and surrounding landscape. Jane: I mentioned in an earlier post on my blog, that I really enjoyed and was inspired by your book Nature Inspired. A book is such an accomplishment! Congrats! What are your next goals-- Or do you have specific goals? Tracie: I am so excited to be pursuing my dreams of licensing artworks, with the debut of a new cotton quilting fabric line from Windham Fabrics hitting retail stores in late 2010, and more soon-to-be-announced licensed products coming to stores in 2011 and 2012. Tracie: Marylin and I live three hours apart. 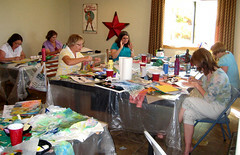 We started by attending an art retreat in Seattle, Washington back in 2000. I was a sophomore in art school then, and was looking for a small weekend break from school that still allowed me to be creative. I asked her to accompany me on this adventure. The experience had such a profound effect on both of us that we continued going, every year, to this same retreat. 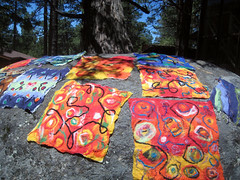 Then in 2006, we decided to make art to sell at the retreat's vendor fair. That event was a huge success, and we had a number of individuals asks us if we were teaching. So we talked with the coordinator, and the rest is history. 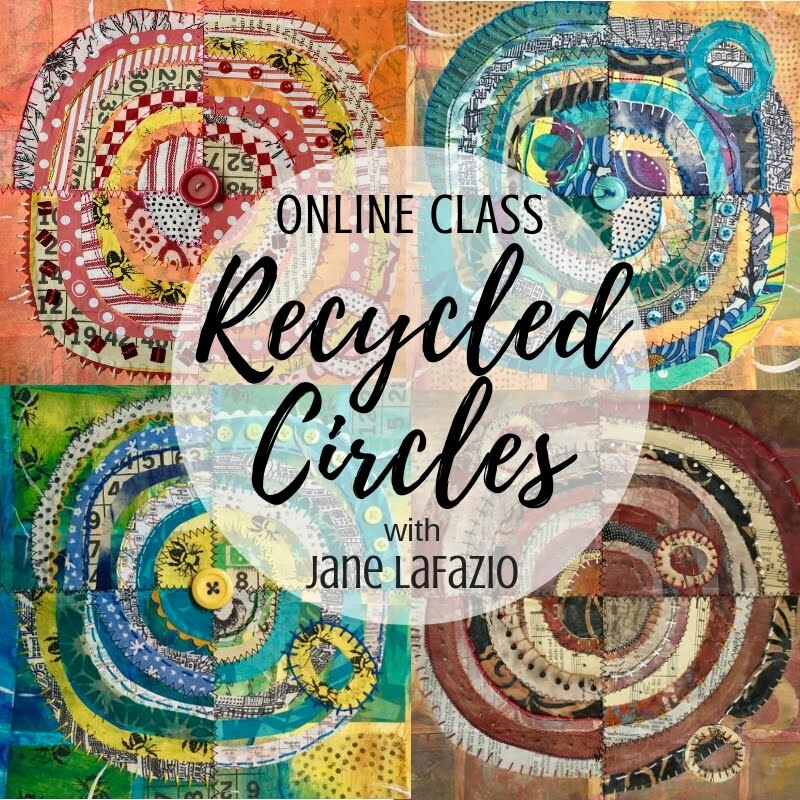 Jane: You’re teaching in Orvieto, Italy with Adventures in Art in September 12-18th and you know I just returned. You are going to love it! Tell us about the week you have planned. Tracie: We will be journaling our journey in Italy as an individual art piece by weaving our experiences and words together through paint and collage, suitable for framing! 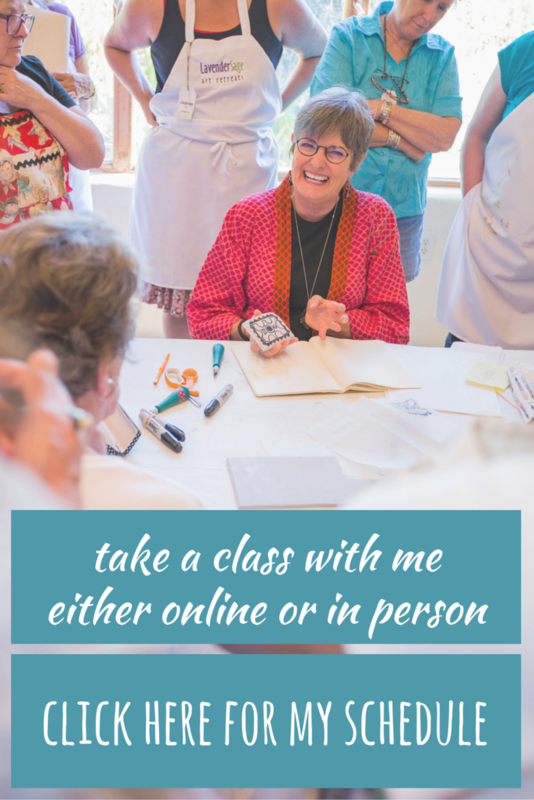 Marylin and I will share secrets for bringing the cherished experiences and the breathtaking surroundings of this ancient Italian hilltop town to life through paint, collage, and journal entries. The result is stunning "art pages" imbued with the colors and textures of Orvieto, as well as new found skills for use in future journals. GIVE-AWAY! 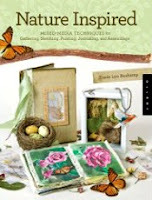 Leave a comment about your own nature insprired work, and you may win a copy of Tracie's book, Nature Inspired! I'll select the name, randomly this Saturday, July 31, and announce it here, on my blog. Check back to see if you won! 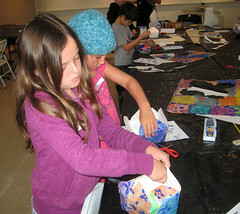 One of my passions is teaching art to kids. 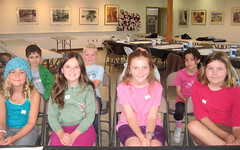 Here are my 8 delightful students, ready for my demo yesterday. All this week I'm teaching every morning for 2 hours. I so enjoy the interaction with the kids. 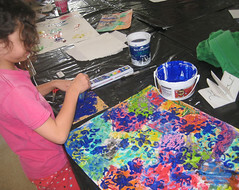 Watching them gain confidence as they learn skills and explore their own creativity. 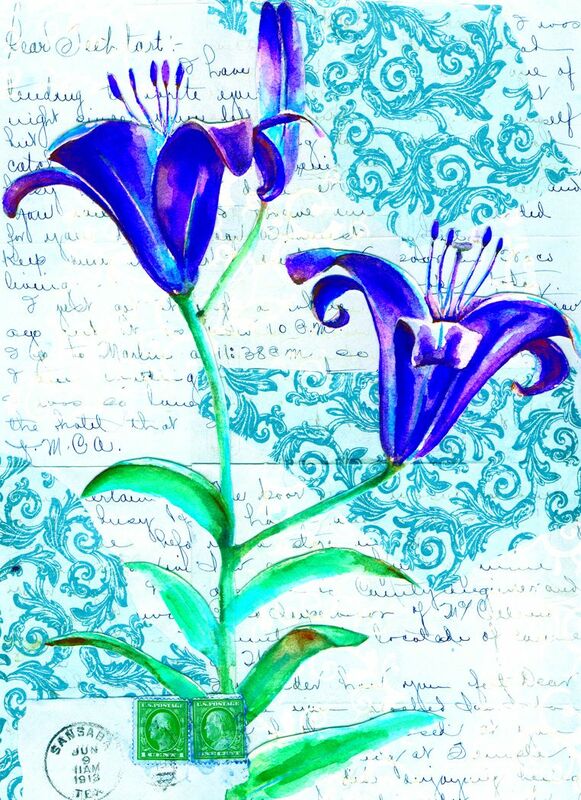 We're focusing on watercolor, as the classes sponsored by the the San Diego Watercolor Society. When I teach kids, I pretty teach them the same things I teach adult students, but with different materials. I loved our project, so I'll share with you. 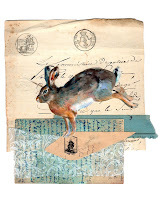 First they created a stamp, using sticky back foam on old pieces of matboard. Then they placed the stamp under a piece of regular drawing paper and did rubbings all over the paper (we used fabric oil pastels we had on hand). 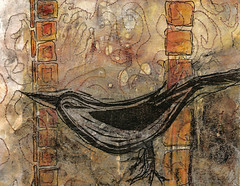 Then they painted the whole thing with different colors of watercolor, and the rubbings acted as a resist. 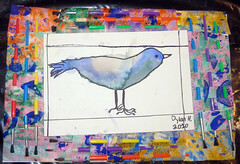 Then using tempera paint in blue, they stamped over the whole thing with the stamp they'd created. Surface design for elementary school kids! 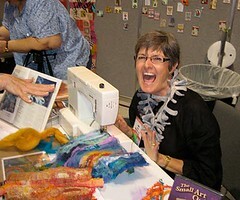 Long Beach International Quilt Festival! 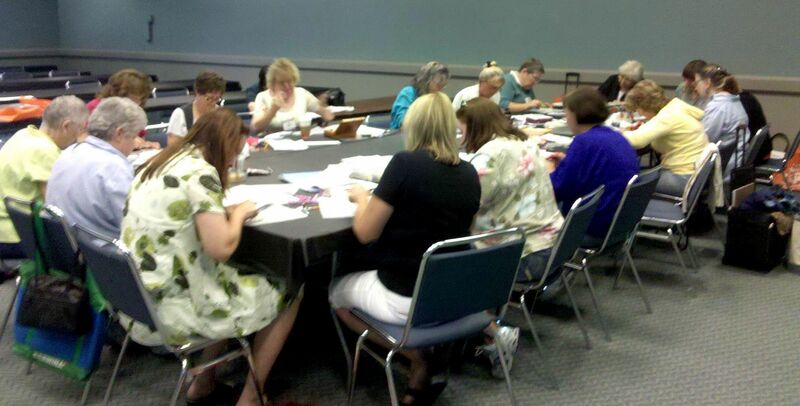 My first time teaching at an International Quilt Festival! 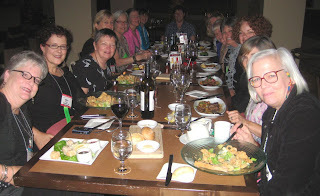 Some of the "dinner at eight" artists from the Beneath the Surface Exhibition. It will show at Houston too! and you can get the book of our exhibition here. I made this in Alisa's Make it University Workshop. From cool trash that she supplied. 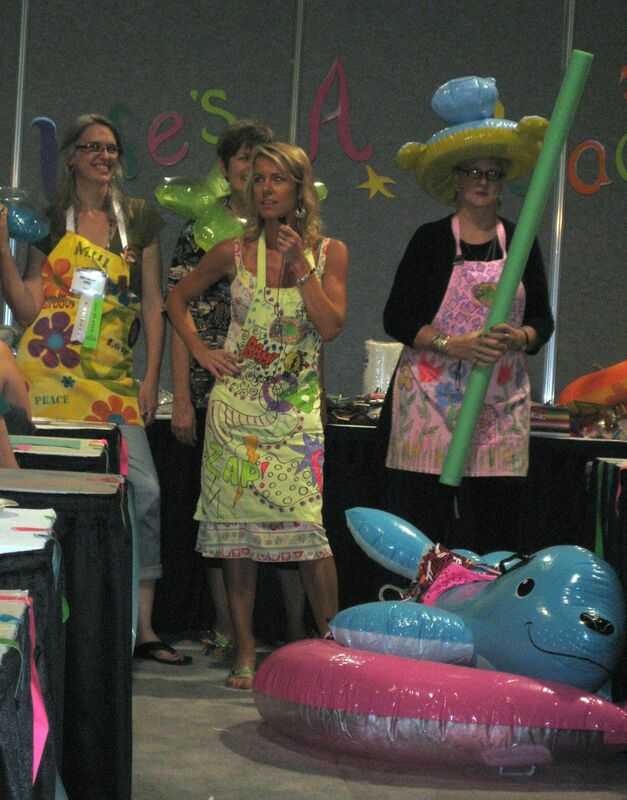 Surviving the Runway, Saturday night, at Make It University, on the convention floor. Such fun and craziness! Judy Coates Perez, Pokey and Jamie Fingal and me. 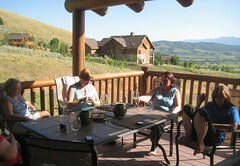 We worked on one page books, in Utah. Mine was extra large, at about 9x17 inches. This is one of the spreads. 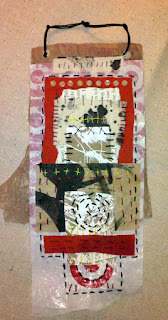 Collage, spray paint, stamps, doodles, drawing, hand stitching. It's one of those projects one could spend ALL their time working on because it's just plain fun! 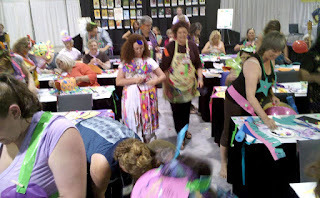 I'm off to the Long Beach Quilt Festival, teaching two workshops Thursday, 7/22 and doing open studios (free, I'm just there working in public) at Make It University on the showroom floor on Friday, 7/23 from 2:30-4:30. Come by and say hi! and of course I'll be there for Pokey's "Surviving the Runway" on Saturday night from 5:30-7pm, same location, Make It University (you can't miss the giant sign hanging from the ceiling of the convention floor.) I'll post on Facebook, while I'm gone. Returning next week! 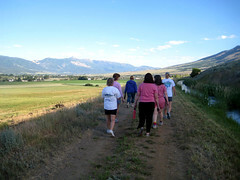 Just got home for Odgen Valley, Utah, where I taught a Mixed Media art retreat. 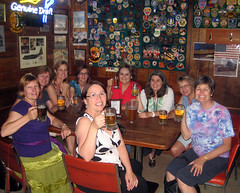 Six wonderful women in my class. 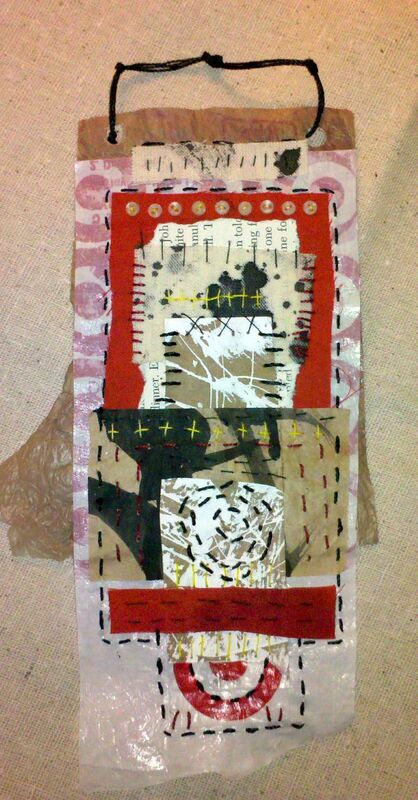 We made mixed media books and fused sheer collage. The setting was gorgeous, and here we are in the 'backyard' spray painting. We visited the "Shooting Star Saloon" founded in 1879. 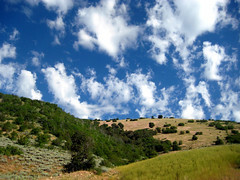 The surrounding hills are views were extraordinarily beautiful. The home we stayed in was beautiful and perfect for a relaxed art filled long weekend. 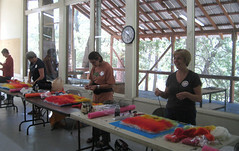 Our workshop was large and cool and hmm, got a little more cluttered each day, so you know we were having fun! 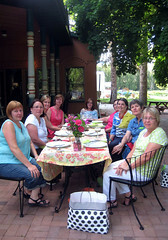 Dinner under huge maple trees at Dottie Becks in Eden Utah, Salmon marinated in maple syrup among other yummies. And shopping too! And we fit in a morning walk too. The rest of the photos from the weekend are here. I'm going back next year to teach "Sketching & Watercolor: Journal Style" in July 2011. I wouldn't say this is my best work, but the process was fun and a learning experience. I was inspired by Alma Stoller's fun tutorial using magazine pages and then Lyric Kinard's post on Citrasolv, which I'd been meaning to try--so I combined the two! 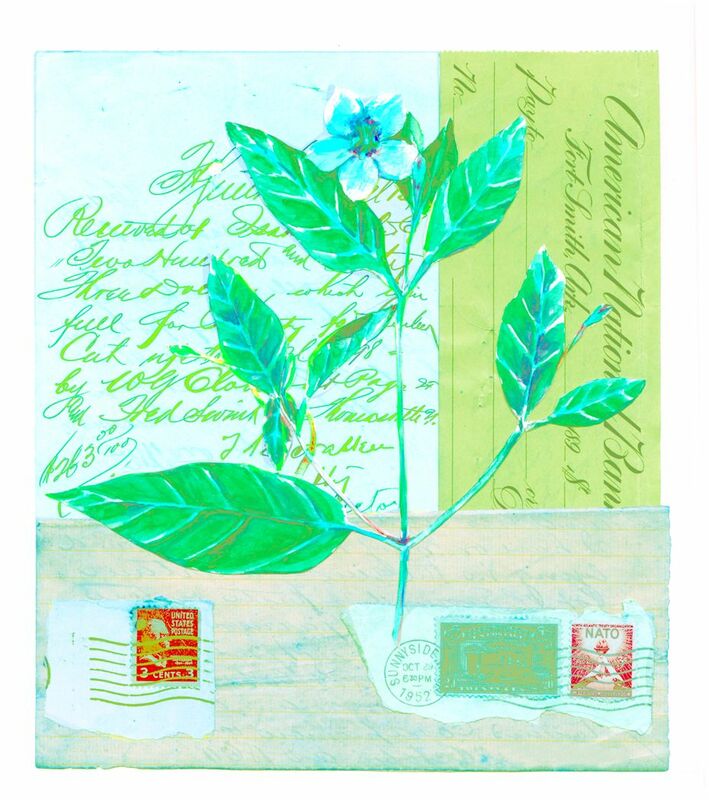 First I used citrasolv on a bunch of National Geographic pages (yes, quite messy and they all sort of look like acid rain) and then I free-motioned one on top of a bunch of old magazine pages...then I doodled on it, and added one of my hand carved stamps. So, like I said, this isn't such a winner, but I have more stitched/citrasolve concoctions ready to play on! I'm off to Utah to teach a retreat, returning briefly next week. See you then! Meanwhile, I'll post on Facebook. 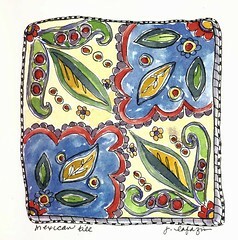 Five inch square watercolor. 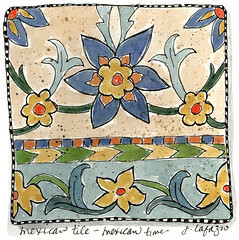 I have quite a few Mexican tiles, and they are really fun and easy to draw and paint. And they would make good subject matter for a beginner. 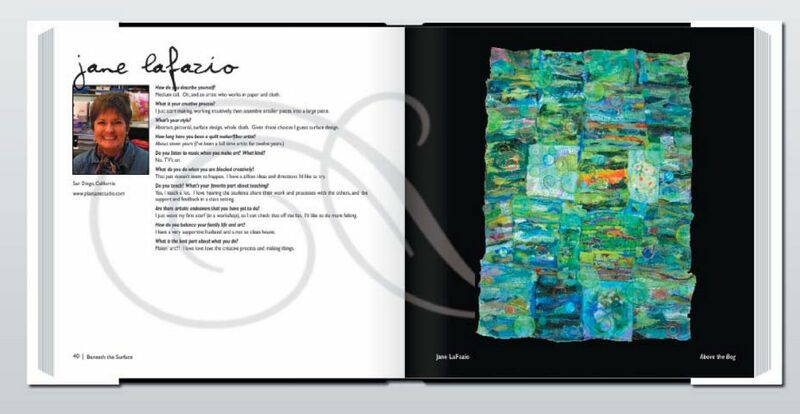 Here's my page in the book, there are about 30 artists and their quilts in the book. $3 flip flops, ribbon from my ribbon stash, an hour or two in front of the TV. Priceless. Made these last night, wore them to yoga this morning. They're happy shoes. 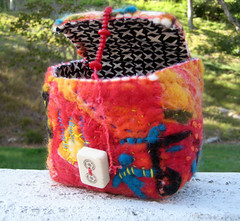 I guess one felt box just wasn't enough......I made another from the piece of felt I made up in Idyllwild this past week. You can see other views of this one here and here. It seems like I have more on my 'to do' list than ever. Yet, I've fallen under the influence of Alisa Burke and Diana Trout! I, who have always done a 'clean' watercolor journal, have started (gasp) a MESSY JOURNAL! Now I'll have a cache for some of my pure 'creative play' in my new journal. I'll keep you posted. I'm preparing for a workshop in San Miguel de Allende, Mexico next year...It's easy to get in the mood, I love Mexican folk art and have a lot of it in my home. Not much time to draw while I was teaching in Idllywild, but I did draw this in our hotel room. 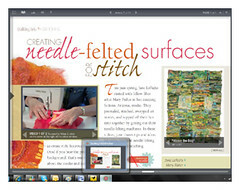 I told you I was in the new eMagazine, In Stitches, and here's my page. (Glad I got a manicure) The image on the left is a video of me machnine needlefelting, and the image on the right is a slide show, not here, but if you purchase and download it. When I showed you the machine needlefelting tutorial on my blog, many asked if it could be done without a machine. 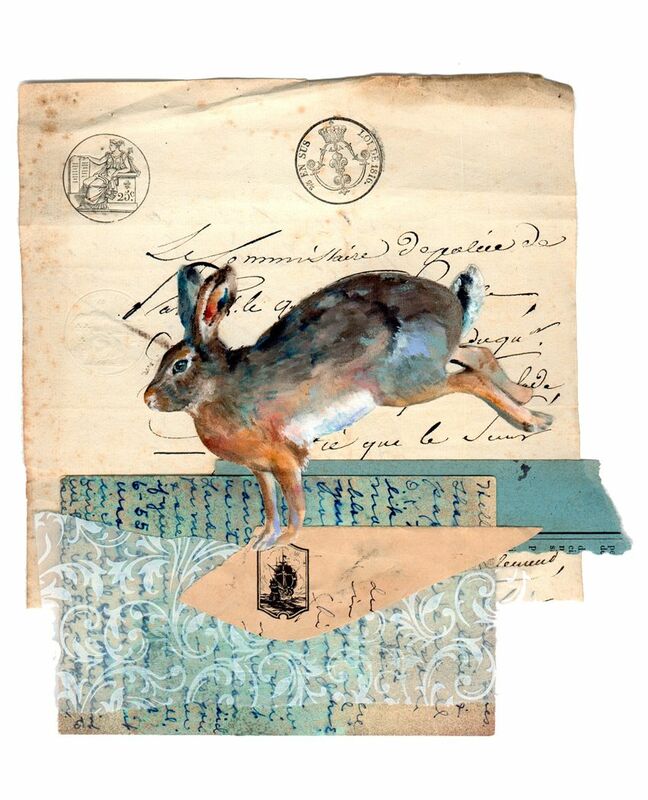 I still don't know, but Suzanne Morgan has written a tutorial combining needle felting by hand and wet-felting. You can see her tutorial here. I khow I want to try it. 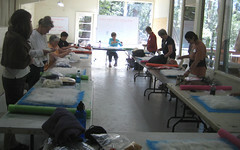 I just returned from a lovely couple of days in Idyllwild, where I taught a one day wet felting workshop. You can see all the pics here. The Idyllwild campus is really beautiful, and I think we got the best classroom! 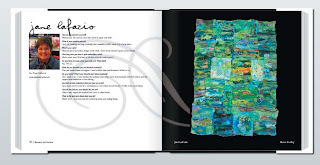 Art Quilt: what is it? 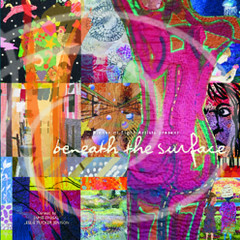 "SAQA defines an art quilt as a contemporary artwork exploring and expressing aesthetic concerns common to the whole range of visual arts: painting, printmaking, photography, graphic desing, assemblage, and sculpture, which retains, through materials or techniques, a clear relationship to the folk art quilt from which it descends." Interesting, huh? No mention of 3 layers, or stitching or materials/process at all. hmmm. Wendee!! Email me and we'll make the plans! 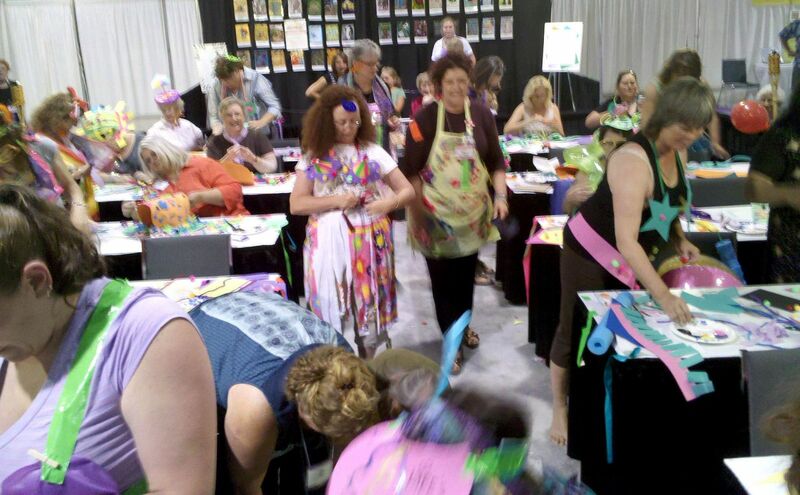 See you on July 22 from 9-noon for my "Quiltlets: Very small quilts for short attention spans" workshop at the Long Beach Quilt Festival. Have you seen this yet? 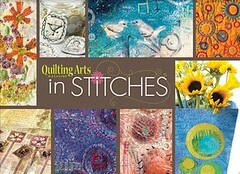 It's Quilting Arts brand new E-magazine "In Stitches." 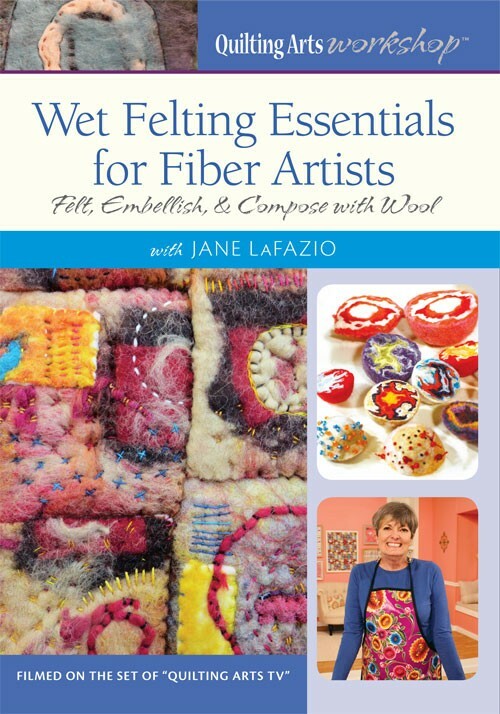 It's downloadable, with videos and slide shows embedded AND an interview of yours truly showing my machine needlefelting. Remember when I was in Sedona, and Mary Fisher's incredible studio--we filmed the interveiw then. Oh yea, and Melly's in it too, show her amazing free motion machine stitching. Just added this Chubby Quail to my JaneVille Etsy Shop! I know, it looks like I'm obsessed with birds. Really, I can do other imagery. Really. 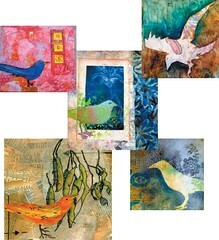 These are examples of what I'll be teaching in Collage 101 on Saturday 8/28 at the mixed media retreat CREATE in Chicago. 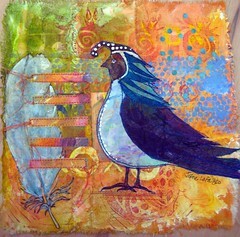 I'm also teaching Fused Sheer Collage on Friday 8/27, and a 3 hour 'Sketching & Watercolor: Journal Style" on Sunday.